I tried 2 varieties of Healthy Choice Breakfast Power Bowls: 1) Turkey Sausage & Egg White Scramble; and 2) Unwrapped Burrito Scramble. Of the two, I preferred the Unwrapped Burrito variety. Both Power Bowls consist of nearly the exact same ingredients. 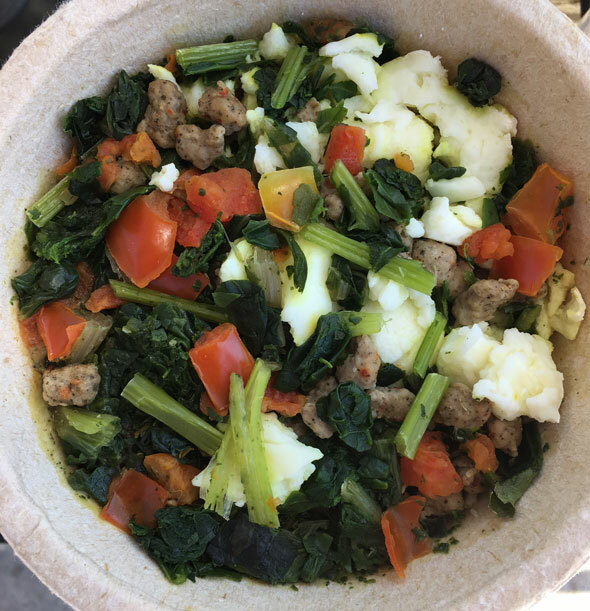 They each have egg whites, turkey sausage, tomatoes, dark leafy greens (spinach, kale and chard) and steel cut oats and ancient grains (faro, buckwheat and red quinoa). However, a few minor additional ingredients makes each bowl taste unique. 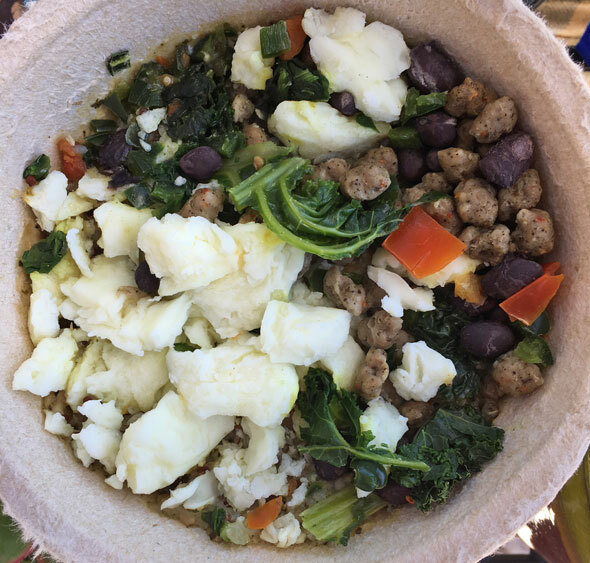 The first version I tried was the Turkey Sausage & Egg White Scramble Power Bowl. I had to overcome a personal hurdle. The idea of mixing steel cut oats with eggs was a weird concept to me. I like oats and I like eggs, but I've never combined the two. I'm glad to report that the mixture made sense. You hardly taste the oats and grains. 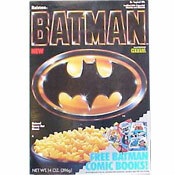 Instead, they seem to add to the overall heartiness of the bowl without being distracting. 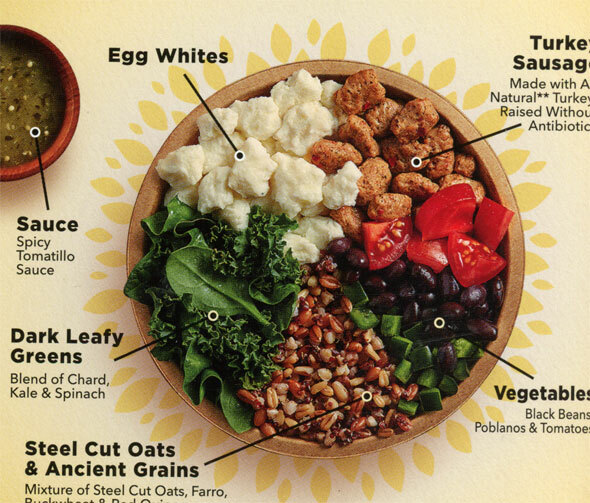 The Turkey Sausage bowl has a lot of leafy greens and tomatoes and they dominate the flavor. The packaging says it has a creamy avocado sauce, but I didn't notice it. The eggs were quite good for a microwave product. Overall, I wasn't very impressed with my first couple of bites. But as I ate more, the sausage flavor seemed to come through more. But the end of the bowl, I had to admit I kind of liked it. Although, I wouldn't be likely to buy it again. 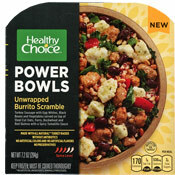 The Unwrapped Burrito Scramble Power Bowl, on the other hand, is really quite good from the first forkful to the last. This bowl includes black beans and poblano peppers. It has a spicy tomatillo sauce that permeates each bite. There's fewer leafy greens which lets all of the other flavors shine. The Unwrapped Burrito Bowl is only for people who like spicy foods. It is really SPICY. I would definitely buy this one again - if I find it on sale. The bowls cost me nearly $5.00 each. Get that price closer to $4.00 and you've got a return customer. These bowls are much more pretty on the packaging than in person, but it's easy to see they use quality ingredients. Both recipes are incredibly bold in their gourmet approach to combining ingredients. I liked both products because they offer something new when it comes to breakfast foods in the freezer aisle. I give the Turkey Sausage & Egg White Scramble 4 out of 7 golden eggs. I give the Unwrapped Burrito Scramble 6 out of 7 golden eggs. 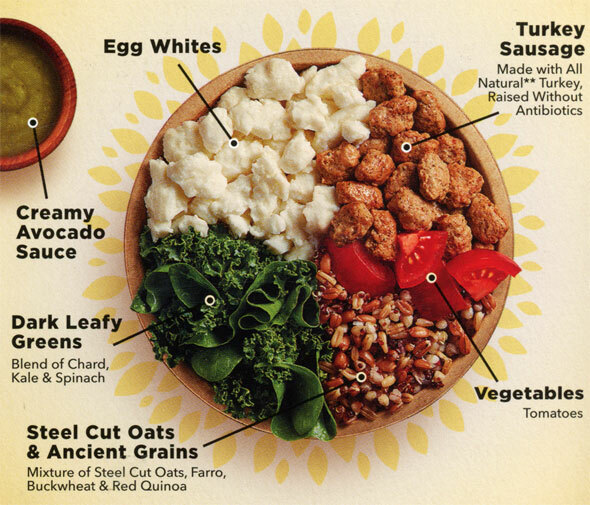 Thus, Healthy Choice Breakfast Power Bowls receive an overall score of 5. 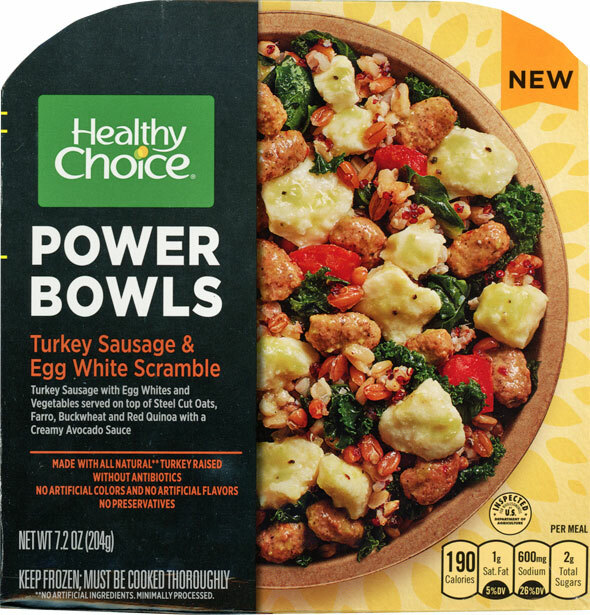 Each Turkey Sausage & Egg White Scramble Power Bowl has 190 calories, 6 grams of fat (1 saturated and 0 trans), 30 mg cholesterol, 600 mg sodium, 18 grams total carbs, 4 grams dietary fiber, 2 grams sugar and 15 grams protein. 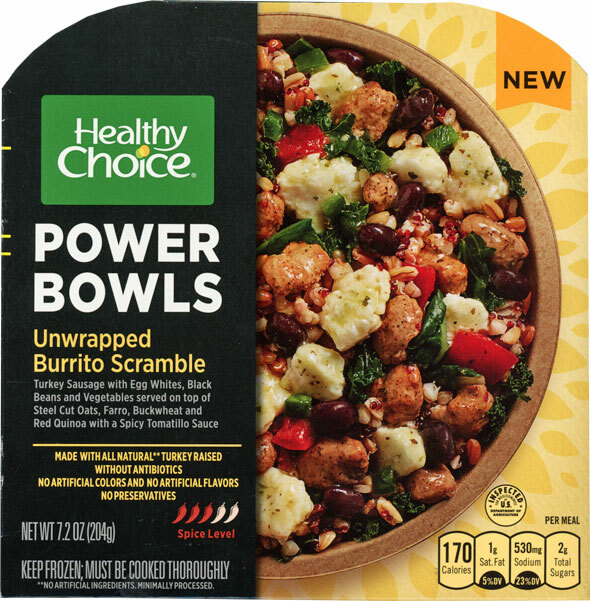 Each Unwrapped Burrito Scramble Power Bowl has 170 calories, 3.5 grams of fat (1 saturated and 0 trans), 20 mg cholesterol, 530 mg sodium, 21 grams total carbs, 4 grams dietary fiber, 2 grams sugar and 13 grams protein. What do you think of Breakfast Power Bowls?